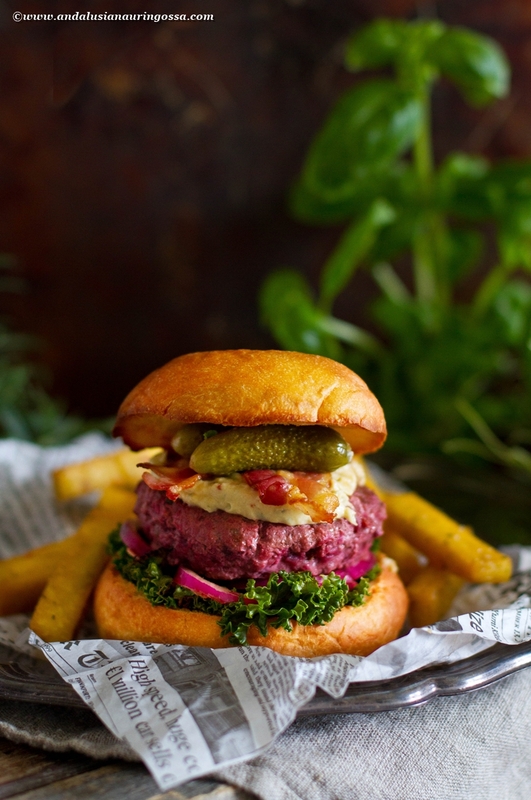 Herby Beef Lindström beef and beetroot patties topped with caramelized onion and mayo dressing make the best burgers right now. Especially with Sileni Cellar Selection's Pinot Noir 2014. I would imagine we eat rather well in my kitchen. Good food made of good ingredients. But trust me, that does not mean I'm stranger to good old mince. Oh no - that's something I always have in my freezer. And if you have a couple of hours to spare, it simmers down to a Bolognese, heaving with such deep flavours of love it easily becomes the star of any Sunday lunch. Since meat has traditionally been the priciest of ingredients in cooking around the world, different cuisines have found ingenious hacks to make a little go further. Wrap in in pastry like tortellinis (or Shish Barak dumplings of my up and coming book!) and a quarter of a kilo is enough to feel a family of 8. Another way of strecthing the buck is adding mushrooms or veggies to it. My absolute favourite is this (despite of its Swedish-sounding name) recipe that apparently originated somewhere in Russia, where they add cooked and grated beets into the meat. I cannot tell you how in love with different variations of Beef Lindström I am. But I can tell you it's pretty much what I've been having every day for the past two weeks. My latest love are these burgers, where the herby beef and beetroot patties are topped with mayo dressing that gets its colour and incredible depth of flavour from caramelized onions. In addition to rosemary thyme and dill are some of the herbs that love the company of beets. For home-made brioche burger buns see my recipe here. For marinated red onion, just see here. Oh, and polenta fries? Right over here! Sauté the onion in oil or butter over medium heat until translucent. Let cool to room temperature and combine with rest of the ingredients. Form the beef mixture into 6-8 evenly sized thick patties. Fry in a pan for about 6 minutes per side. Caramelize onions in a pan or coated pot, stirring every now and then, until they are golden brown and start to crisp. Let come to room temperature and measure into a food processor. Blizz until smooth, check the taste and season asif needed. Roast the bacon in the oven at 200 on a parchment-lined tray until crips. Drain on kitchen towels and cut in half. Soften the kale, covered, on a hot pan in a little bit of water for a couple of minutes. Half the brioche buns and toast them. Spread a little dressing on the bun, followed by kale and marinated red onions. Top with the beef and beetroot patty, generous dollop of the dressing, bacon and cornichons. Place the top half of the bun on top of it all and feast. And a burger this tasty deserved a beverage of same calibre. Once again I found the perfect match from New Zealand Pinot Noirs. 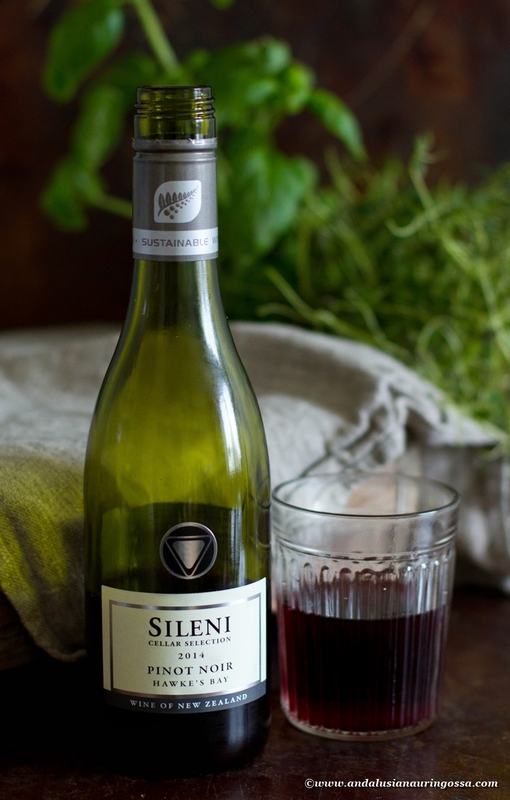 Sileni Cellar Selection Pinot Noir 2014 from Hawke's Bay region on the East Coast of New Zealand is a newcomer in my wine arsenal but a firm favourite already - showcasing so many of the qualities that make New World Pinot Noir (especially ones from NZ) such sweethearts of mine. It's medium-bodied, blessed with soft berriness such as cherry and raspberry. It's also got hints of violet which, together with the gentle oakiness, pair well with the sweetness of the beets and the robust choice of herbs.